I could arguably claim that waffles are one of the greatest breakfast foods out there. Ok, maybe not ever, but it’s definitely my go-to splurge for brunch. Even growing up, it was completely normal for us to eat an Eggo waffle topped with butter and syrup for breakfast during the week. I can almost taste the flavor of the frozen waffle, smothered with sugary Aunt Jemima. Maybe the fact that I ate them so.darn.much has ruined most frozen foods for me. That or the fact that I’ve become a food snob and accepted the fact that frozen food just doesn’t taste as good as you want it to. I recall the days of high school cross-country where we would run our hearts out most of the time – all week –, labor – glide through a long run, all in anticipation of hanging out together at the local breakfast spot. Actually, I wouldn’t be surprised if all we talked about during our run was food. As a matter of fact, I know that’s all we talked about if it was a conversational run. We would stumble in, grab as many tables as possible and get ready to eat back all the calories we just burned. I think there was one day where we piled 10 or 12 people in a SUV. The look on some poor older woman’s face when we all piled out was absolutely priceless. All in the name of brunch my friend, all in the name of brunch. Back then I actually was more of a pancake gal, mostly because that’s what everyone else was getting and it was the best bang for your buck. Most of us would order the “The 2x2x2” (2 pancakes, 2 eggs, 2 pieces of bacon/sausage) along with chocolate chips. We should have had them name the meal after us or at least give us a discount for having so many people order the exact same item. Those of us who were around during Thanksgiving would meet up after the annual Turkey Trot and catch up over breakfast. I still think my sophomore year and senior year of cross country were some of my favorite times. I’ve always heard people talk about the infamous Roscoe’s Chicken and Waffles, located in Pasadena and Los Angeles, but every time I consider going, I’m convinced otherwise. You know, I don’t even think that fried chicken and waffles make for a good combination, but it’s worth a shot, right? 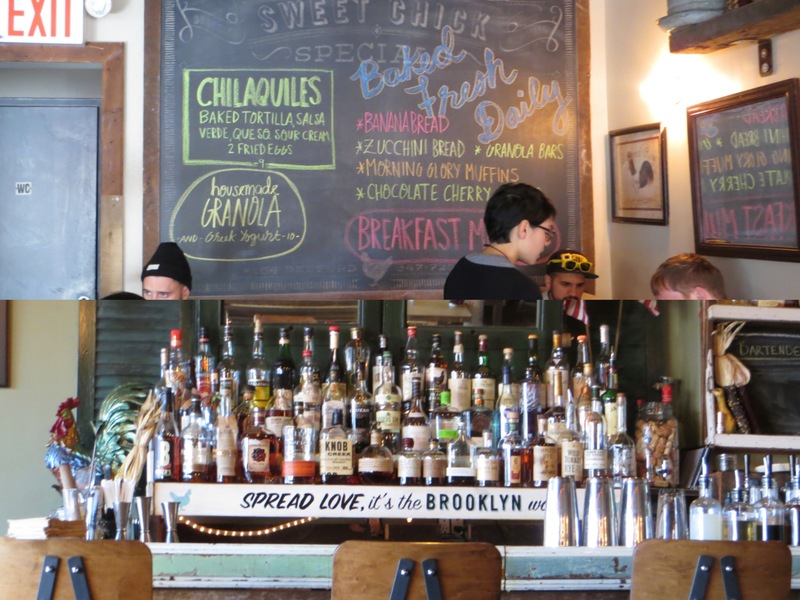 Well, Hope and I had a shot to test it out when we hopped over to Brooklyn for brunch and stumbled upon Sweet Chick, a hipster little restaurant that promoted its chicken and waffles. Actually, let me rephrase that. 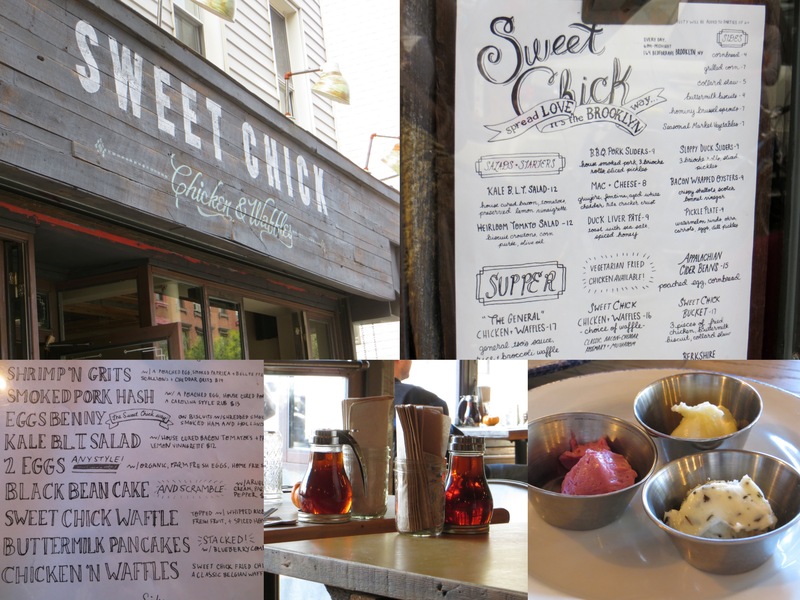 We found Sweet Chick the first time we were in Williamsburg and made a POINT to go back, just for their waffles. Since we have since realized brunch is a popular thing in New York, we knew we had to make it there early, otherwise we would be left with our stomachs rumbling and a wait time of 20-30 minutes (if we were lucky). We arrived around 11:15 (they opened around 11) and had no trouble finding a table and immediately started to peruse the menu. Oh my, the options were endless. Usually I’m one of those people who studies the menu before arriving, picking out which meal would be decadent, which would be healthy, and which I’ll end up with. In the past I’ve been known to scrutinize the calorie content, ending up with an entrée that never satisfies. Now I try to stick to something that won’t exactly leave me in a food coma, but still pleases the palate. Hope started out with a mimosa while I selected the 2 cup French press. When the opportunity arises to have my own pot of coffee, there is no reason not to. She also went with the classic “Chicken ‘N Waffles”, which was indeed an interestingly good pairing. After hemming and hawing over what to get, I made a last minute decision to go for a restaurant staple – the “Sweet Chick Waffle” – doughy waffle topped with whipped ricotta cheese and seasonal fruit. Honestly, it might have been the best waffle in my entire life. Even the syrup that I spread over the fruit didn’t leave me with a sugar hangover, something that is quite rare when one orders dessert for breakfast. As you can see from the bottom right picture above, I had no problem cleaning my plate. Have you ever had fried chicken + waffles? What are some odd food combinations you enjoy or have heard of? This entry was posted in Eating Out, New York and tagged breakfast, Brooklyn, brunch, chicken and waffles, running, Sweet Chick, team, Williamsburg by Kaitlin. Bookmark the permalink. I grew up with eggo waffles and butter every morning too. Even last year I went with a classic kashi waffle every morning. Now I’m back to bagels but you know I appreciate a good sweet brunch 😉 I think waffles and pancakes are just such a classic staple. You and your roommate have done some serious exploring in the few months you’ve been there. I cannot wait to crash some of the adventures! Chicken and waffles are amaaaazing! I swear I must have some southern blood in me or something because I’m kind of obsessed with them. Those chicken and waffles look amazing! That is QUITE the southern thing! I might have to check out the real deal with sweet tea too. Thank you! I looove waffles! I actually had my first bacon waffle from a food truck at SCU. 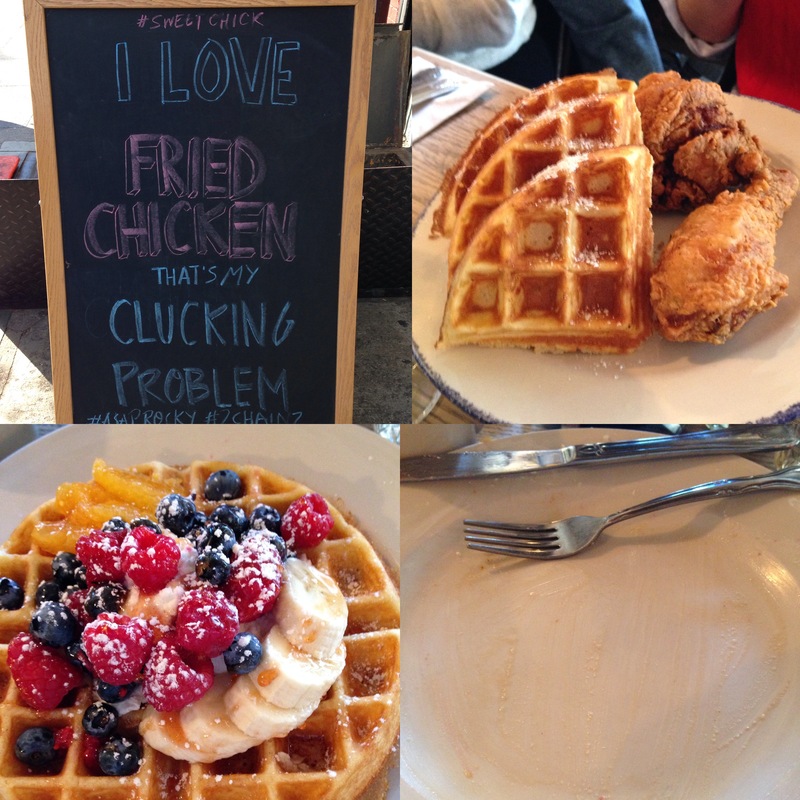 They also sold fried chicken + waffles! Ah I saw that picture and it looked divine! How fun to have food trucks with such eclectic food. i have never had fried chicken and waffles before but it’s on my food bucket list!!! what a COOL restaurant! give me that black bean cake! i’m not a big mimosa fan because they remind me of my college standard drink, oj and vodka. anything with oj makes me want to vomit. too many rough nights. love french press coffee though! i was never a big waffle or pancake eater as a kid, but in high school i was all about my local diner’s chocolate chip pancakes.